Hey everyone, welcome to my personal finance blog, Appetite for Investing. I created this blog after realizing my passion for learning how investing in the stock market with a long-term mindset makes your life so much easier. And by long-term I mean like 40 years. And by easier I mean learning how to not get taken advantage of by “financial advisors”. I learned all this while I was commuting to and from work every day for the past five years. My name is Alberto, and I want to help you learn how simple making extra money, saving it and investing it for your retirement really is. It all started in January of 2015 when my dad gave me a book by Tony Robbins, Money Master the Game. The book covers a broad range of topics from index funds to annuities to real estate. The book made me realize people in the industry use financial jargon to confuse us and make this topic of money seem hopeless to understand on our own. The book went on to talk about what index funds are and how you’re probably getting charged too much in fees by your money manager. On top of that, the book explained how the mutual funds your financial advisor placed your money in also has fees that are too high. It was mind blowing to me what an easy read this book was. I started to think if I could understand and enjoy this book, then what do I have to lose? Over three years later and who knows how many books, I began to realize I understood more than my friends and family. They literally began asking me for advice and what books to read. I was also looking at my own spending habits and seeing where I was throwing money away. Look at that interest!! All from two cups of coffee saved. The lesson here: just drink the coffee at work. I know it might not taste as good, but it’s so worth it. Then, I started to look at what I was having for lunch. I was spending about $10 each day on lunch for a sandwich or whatever else I was eating. I thought to myself, “well how much would I save if I went grocery shopping for cold cuts, bread, etc. instead?” According to health.com a homemade lunch costs $3-$5. Let’s say it costs the higher end of $5. I save $5 per day or $1,200 per year if I worked 240 days a year. 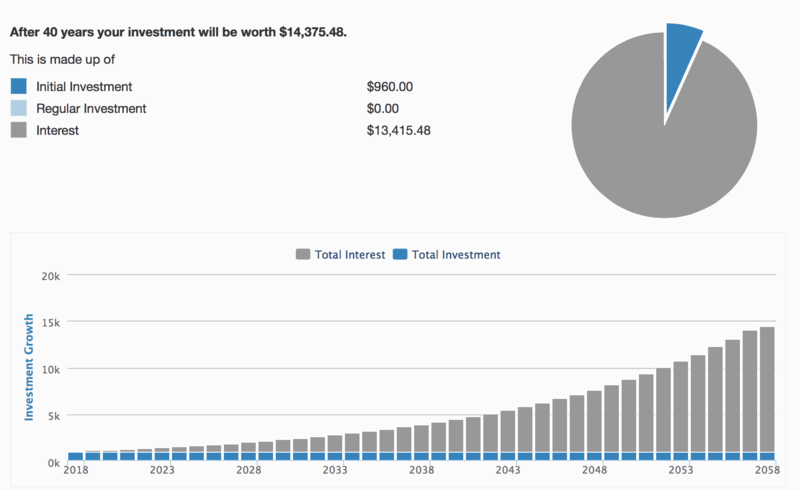 So then I added the $1,200 to $960 and multiplied it by 40 years at a growing rate of 7%. It came out to be a whopping $32,344.83 if I never made another addition to this. 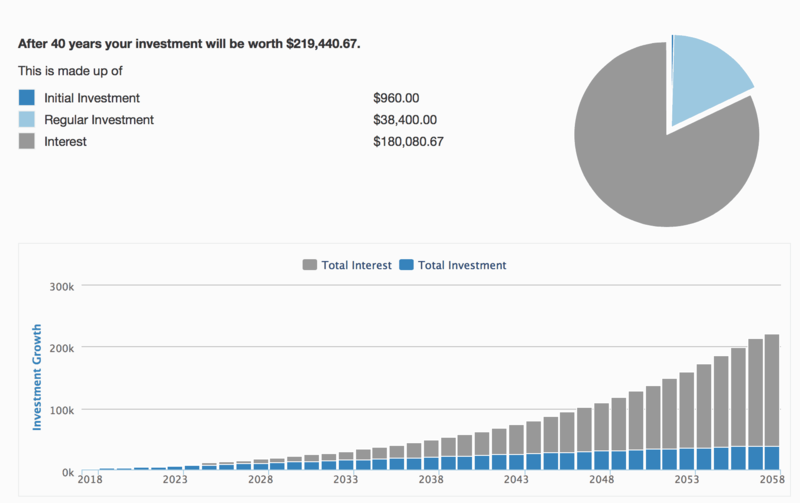 If I invested the same amount annually, it came out to be $493,741.50…All from coffee and sandwiches. This isn’t even including if I reinvested dividends. You can easily do this if you just pay attention to the little things you’re paying for that you think don’t matter in the long run. If you add up all those things, whatever they may be, you’ll probably find it’s a similar situation. I was so excited by this, I wanted to be able to help others on a much larger scale without having to actually become a money manager because of the conflicts of interest that usually occur in the industry. For me, I wouldn’t be able to do it. It feels so wrong recommending something you know in your heart is not right for your client. So, one day I was browsing the internet and came across a personal finance blog. I thought it was the coolest thing. One of the articles I read was about their monthly readers which was literally in the millions, and I thought to myself, “I need to do this.” Two months later, Appetite for Investing was created. A blog with a focus on making extra money, saving it and learning what to do with it through long-term investing. I hope this blog benefits you as much as it gives me pleasure to be able to hopefully help you. You can do this, it just takes a little bit of focus to get started and then you’re off to the races setting yourself up for financial freedom. To subscribe, fill out the contact form below. Let me know what topics you’d like to read about!